Ferrule tubing is used to space shutters and to recover expensive formwork shutter tie-rods (Ferrules / Tie Rods). The inside diameter of the Ferrule tubing needs to be at leat 1mm greater than that of the tie-rod (Ferrule) being used to fix the formwork shutter. Ferrule tubing end cones are inserted at each end to seal off the hole in the shutter. Ferrule Tubing Push-on Cones (End cones) are used as ends on Ferrule Tubing (Tie-rod sleeves) to space shutters for the thickness of the concrete casting. Fits on the inside of the Ferrule Tubing (Tie-rod sleeve). Can be removed after the shutters have been dismantled and be used again. These Ferrule Tubing cones allow 10mm spacing on each end of the Ferrule Tubing, on the insside of the formwork. The 30mm Ferrule Tubing End Cones were made for the 22mm (ID) x 25mm (OD) Ferrule Tubing. These Ferrule Tubing cones allow 30mm spacing on each end of the Ferrule Tubing on the inside of the formwork. Ferrule tubing permanent cones could be used as a substitute for ferrule tubing end cones (push-on cones). They remain in the concrete after the shutter has been removed and are plugged with a matching cap to ensure a clean and neat finish of the concrete casting. They save time and money because labourers won't have to patch up unsightly holes left as a result of tie rod holes. 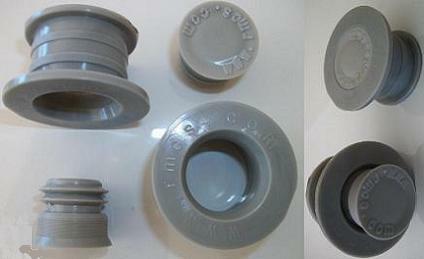 Sold in pairs - cone and plug.